At 31, Leon Johnson will know that time is running out on his hopes off adding to the nine Test matches he has played. The Guyanese left-hander from GCC, the oldest Cricket club in the West Indies, has led Guyana to every First Class title since Barbados won its last one in 2014 and with four consecutive titles to his name he is widely regarded as the best Captain in the Region. But the former West Indies U-19 Captain will also know that while he is the best candidate for the job as Windies Captain, he must first earn his place in the team with plenty of runs in the 2018/2019 Regional First-Class which bowls off on Thursday. Kraigg Braithwaite has lost all four of the Test matches since he took over the Captaincy from fellow Bajan Jason Holder who lost 15 off the 27 Tests he has been leading West Indies since 2015. Braithwaith’s batting Average has dipped to 35.22 and he has not passed 13 in his last his four matches; against India and Bangladesh. Eyes on prize! An outstanding season could put Leon Johnson back in Windies colours. Under the combination of Holder and Braithwaite, Windies have only won seven matches and two series (against Zimbabwe & Bangladesh) in 12 series and four years. As Johnson gets ready to play his 100th First Class match since making his debut in 2004 against the Leewards at Enmore on Thursday in St Lucia, he will not be only thinking of replacing Braithwaite as Captain but of reproducing the form he showed in the 2016 Regional season. Johnson lasted played Test cricket in November 2016, scored the most runs (807) from 10 matches with an average of 57.6 with two centuries and five fifties in the 2016 domestic season. Johnson made 165, his highest score last season and got a brilliant hundred on the last day of Guyana’s final practice match last week and if he can get hundreds in Guyana’s two matches (in St Lucia and Antigua) before the break for Christmas and follow that up with a good performance in Guyana’s first game in 2019 in Barbados, he will enhance is chances of forcing his way back into Windies colours for series against England, especially with the mediocre performances of those in the team presently. Leon Johnson First Class Captaincy record: Debut 2013 v Windwards in St Vincent, 42 matches, 28 wins, 5 losses, 8 draws and 1 Tie. Johnson, a number four batsman for Guyana, scored 66 and 41 on his Test debut in 2014 against Bangladesh in the unaccustomed position of opener, a position he was again asked to bat in when he made one and 12 in his last Test against Pakistan. On the 2014-15 South Africa tour Johnson averaged 33.60 – only Marlon Samuels and Kraigg Brathwaite were better but he was surprisingly left out for the England home series and was not selected for the Australia or Sri Lanka series in 2015; a period which coincided with the controversial sacking of Guyanese Shiv Chanderpaul. The stats of the Jaguars’ Skipper are not a true reflection of his ability; he has only converted five of his 38 First Class scores of 50-plus into hundreds and his return to Windies team is in his own hands and he needs to let his bat do the taking. 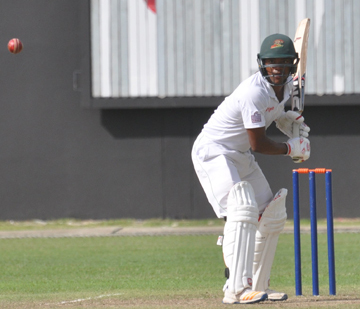 Guyanese Vishaul Singh has also not been given a fair run and while he might be a bit uncomfortable to the short balls, the batsmen in Bangladesh with the exception of Shimron Hetymer and Shane Dowrich, are at sea to quality spin bowling. Jaguars’ Head Coach Esuan Crandon is the most successful Coach in Regional First-Class cricket and it is time for him to be included in the Barbadian dominated Windies Coaching staff. Chairman of selectors Courtney Brown’s team is embarrassing West Indian fans and its time for him to go, while the Foreign Coaches are doing nothing for the team and there are enough great former players who understand the West Indian culture and are good enough be appointed Head Coach by CWI. It is said that bad things continue to happen when good people do nothing.